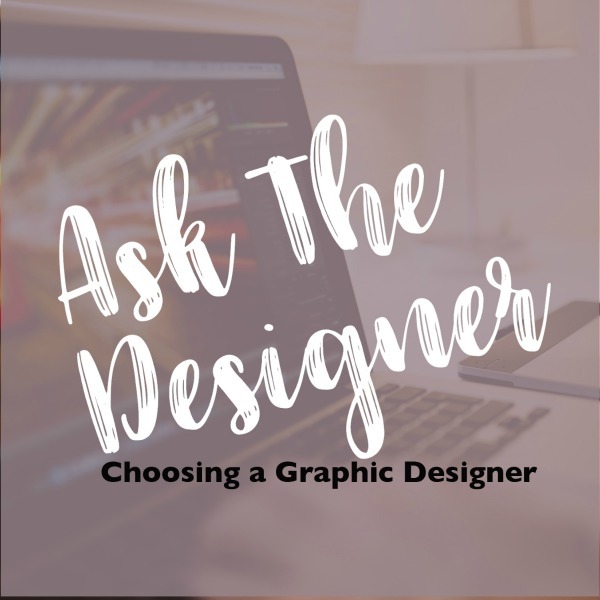 Patrice’s Note: As a graphic designer in Orange County, California, I get asked all the time about best hiring practices. The truth is I don’t know that much about them so I reached out to my amazing client Tami Wiersma of Quad County, Inc who specializes in human resources! Enjoy the guest blog!! Which brings me to the topic at hand: Independent contractors vs employees. You have to pay them both, but should you treat them the same? No, and the reason is clear. As a small business (no matter the entity: sole proprietor, LLC, or a sub-S corporation), it is really easy for a solo owner to hire people to support their business operations and call them independent contractors, especially when they are only working as needed or part time. No timesheets, no taxes, no hassles, right? Somehow they can justify it the same as someone would justify paying cash to a babysitter, gardener, or housekeeper; but that isn’t the way it should be. There are so many resources on the internet offering checklists of what makes a hired worker “a W-2 employee” or “a 1099 contractor.” I think the biggest myth remains that it must be ok to hire someone on 1099 if they aren’t working for you on a full time basis. So IC vs EE? Here’s a quick way for a small business owner to figure out which one works for you. Answer these questions and be honest! IT Contractor hiring a part time student as a sales person to grow their business. In all three of these scenarios, these MUST be employees because they are providing your services to your clients. This is the biggest trap when hiring individual people who will ultimately become your competitor in 2-5 years when they too become successful at their own business. They can only be legit subcontractors if the person hired is: also incorporated, has their own entity offering the same services to the public, and has the proper licenses/insurances/tools/equipment, etc., and are permitted to compete with you in the public arena. And even if all these points are satisfactorily met, it is still better to maintain the control and keep them as employees. So what about these scenarios? These are all specialty, non-essential positions and are sometimes short-term (photographer or plumber), or very part-term but long term (i.e. bookkeeper). In all three of these scenarios, these MUST be employees *IF* the person hired is NOT incorporated, does not have an established and legitimate business (sole prop/LLC) of their own offering the exact same services to the public, and does not have the proper licenses/insurances, etc. This is often the case where someone says they freelance, but only work for one or two companies part time. However, if they do have all these protections in place, then they can most likely be an independent contractor. Once you establish that someone might be a subcontractor or 1099 staff, you must treat them as such. They don’t fill out timesheets, they don’t get overtime or get paid on a routine basis (like payroll), and you don’t exercise control over their job. You tell them what to do (end result) and when it is due (to be completed), but not HOW to do the job (step 1, step 2, step 3…) and WHEN to do the job (i.e. come to my office between 8 – 5, M – F). Very importantly, you also do not provide them with any tools to do their job… no business cards, no phone, laptop, etc., no desk/office/workspace, no hand tools, no mileage allowance, no software. Why? Because any legitimate 1099/contractor already in business, will have and use their own preferred electronics/communication devices, tools and specialty equipment to do their specialty job: expensive camera, car, cell phone, accounting software, licenses, plumbing supplies, etc. It is very important to not create a huge undertaking to force someone who should be a W2 employee to be a 1099 contractor to skirt the rules. It just won’t stand up. Too many people have done it before you and have been caught. Granted, many more people have done it and gotten away with it for years, but why tempt fate? Even if both parties want to or agree to permit a mutual 1099 relationship without meeting these requirements, it doesn’t make it so. You cannot contract to break the law. I leave you with the following: Use legit subcontractors if you need to. But when you need to take the leap and hire help, get excited for your company’s growth. When you hire your first staff member, even part time or “as needed,” then do it right the first time. Contact a professional who can get it done right in the fraction of the time it will take you to get it done halfway right. Once you lay out the important groundwork to take on your first employee, it’s easy to duplicate the rest. Tami Wiersma, PHR, CP-SHRM | QCHR, Inc.
Tami is a semi-mythical HR enigma who both enforces rules for small companies yet is constantly trying to create ways around them. If there is a loophole, she will find it (and close it for you). In her personal life, she is obsessed with pairs and purple stuff. Want to know more? Visit her website and schedule a consultation. I have piles of business cards all over my office. I get new ones at every meeting I attend. When I hand someone my business card, I often hear “I don’t bother with business cards” which is followed by an admission that they prefer to use technology to collect information. I understand, I do. You have a lot of them, you don’t want to organize them, they get lost and you figure “Why bother.” Here are three reasons, why you should bother to use a business card. Business cards are one of the most affordable marketing items to have created and printed for you. Be prepared to spend at least $190 for well-designed business cards on good paper. Bonus points if your card is colorful and memorable. They’re a great conversation starter and a relationship building tool because they help people get to know you and your business quickly. Plus, people expect you have one and you appear more professional to others when you have a business card. It’s important to have them on you at all times because you never know when an opportunity is going to present itself. Every 2,000 business cards you give out has the potential to raise sales by at least 2.5%. That’s a lot of business for a small investment. You can leave them on a card rack, a table or with a friend or colleague and trust they will be your best salesman. They convey what you do in an easy to share format and they are your first impression when you can’t personally be there. They are great at helping you get a referral too! There is nothing more flattering for business people than getting that referral. A business card is an easy low-tech way for anyone you know to give your information out and have their friend or family member contact you! Business cards need very little upkeep and once you have a great one created for you with accurate information they will last and last. As a graphic designer, I would love for you to redesign your business cards every 5 to 10 years as your business grows, changes and rebrands. The reality is that not all business owners will do that and many will keep the same business card for the entire life of their business. I’d rather a business have an older styled business card than no card at all. I hope these three short reasons will give you pause the next time you aren’t sure whether or not you need a business card. They’re your trusty side-kick in business and won’t let you down even when the wi-fi and cell service does! What are you waiting for grab your trusty business cards and go make a great first impression! If you’re struggling with creating a great business card and want a professional to do it for you, contact me. I’m always happy to help your marketing materials look good so you can sell more! The 1980’s were a time of excess and change. The economy in America was booming, walls (both figurative and literal) were coming down. This was the height of the “Me Generation” where individual identity and capitalism reigned supreme. MTV was new and very popular, cassettes and vinyl records were the music listening formats du jour, personal computers were the hot new thing and everything was just bigger, brighter and looking toward the future. Design in this era was no different. Here we take a look at the big, bold, futuristic design style of the 1980s! A very popular style was the Memphis Design Style that was named for the Memphis Group. 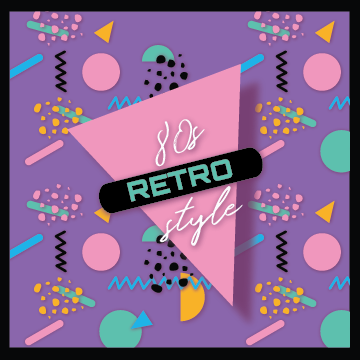 This style includes bright colors, large geometric shapes, and a flat 2d look that have become part of the hallmarks of 1980s design. Another notable design style is a futuristic style that includes lots of black, bright colors, gradients, sharp lines and symmetrical grids that evoke the feeling of computers and technology that was on the rise at the time. Other notable elements include matched elements, farmhouse/shabby chic, incorporation of American flag motif or colors, and type effects such as neon light, mirrored, metal, and gradient styles to name a few. As of October 2018, the style of the 1980s is trendy. Brand leaders who are influencing design trends and calling the shots for advertising and design are creating visual styles for companies by finding inspiration in their 1980’s era youth. It provides these decision makers a feeling of freshness with its geometric patterns and script fonts while still providing a sense of nostalgia for these leaders who are in their late 30s and early 40s. This style is especially great for a brand whose target market grew up during this time period. It allows the business to call back a time of prosperity and appeal to the nostalgia of the community. Also, can be used if the business simply wants to be on trend for the current year. If a brand doesn’t have a target market that grew up in the 1980s then use this style very sparingly. Best used for advertisements, flyers, or for a special 1980s themed event. 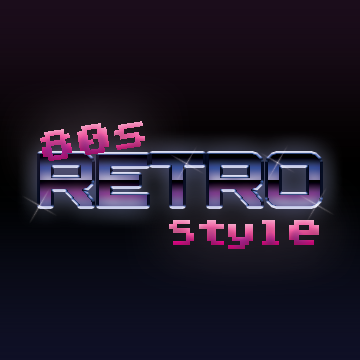 Personally, I wouldn’t recommend it be used for a company logo unless the business is an 80’s themed brand. The 1980s look is about contrast and excess. Mix elements that are opposite of each other and make things big. Remember more is better! For example, layer a pastel background with a large flat geometric pattern is a jewel tone and top the whole thing off with a brush script or use a background in black and layer on a symmetrical grid and use with blocky type in a neon color that also uses neon effects. It’s a really fun decade so make sure that playfulness and sense of fun come through! I’ve had a wave of calls recently asking me about brochures and their lesser-known cousin, the rack card. As a graphic designer in Orange County California, I do all kinds of brochures and I’ve started doing a lot of rack cards. Because I’ve been asked about them so much, I wanted to discuss the differences between the two. Let’s start with a brochure. Most of us think of a brochure as an 8.5 inch x 11 inch sheet of paper folded in thirds with information on each of the six panels. This is called a Tri-fold brochure and it is only one type of brochure. While brochures can be a piece of paper folded in different ways like a Tri-Fold Brochure or a Gate Fold Brochure. They can also refer to small booklets too. Brochures are tried and true. We’re all familiar with the format and they do a good job of segmenting out the information and helping to promote a business, event or whatever content they hold. 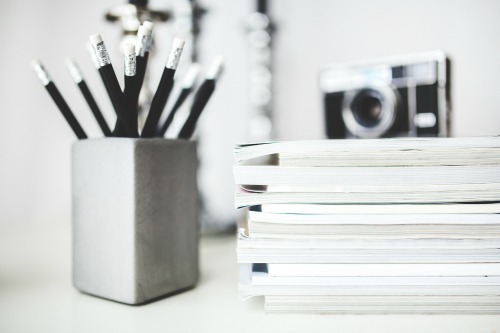 When I first started my business, I was told (as I’m sure many other business owners were told as well) that I needed a website and I needed a brochure. That was it. The website told the customer everything they needed to know about my business and the brochure was a great leave behind for a face-to-face meeting. If they were interested in me after the meeting, they’d read the brochure and then go to the website. That’s what I’ve seen from businesses for the last almost seven years–Websites, brochures, and business cards with the odd postcard or flyer thrown in for extra oomph. Well, everything old is new again and people are starting to circle back around to rack cards. They are less expensive to create than a brochure and are great at doing support work for a business’ other marketing materials. So, what is a rack card exactly? They’re skinny 4 inches x 9 inches cards with information about a particular business or event on them. As someone on the phone said to me in trying to explain what they were looking to have me create for them “The thing I want, it’s kind of like a brochure and a flyer had a baby. It’s flat like a flyer, but skinny like a brochure”. This happens to be exactly what a rack card looks like; a skinny two-sided flyer. I love them because they are so good at doing support work and are a great middle ground between an information heavy brochure and an image centric flyer. They are also very versatile. You can put information on one side and photos on the other, photos and information on both sides, or just photos or text. Another great thing about rack cards is that they are slim so they can be easily stored in a bag or folder and handed out at meetings, left on tables at networking events or just put out in information racks (hence the name by the way) or on a table. If you are looking for an easy way to support your brochure and website or need to hand something out at an event consider a rack card. If you need help designing a great brochure or rack card that will fit in with your new or existing branding, contact me today! The purpose of design is to help communicate information using visuals. As a graphic designer in Orange County, I can’t think of anything that would need to communicate information better than a map or diagram. It’s one of the best ways to help get hundreds of thousands of visitors from point A to point B. Today I’m going to tell you about the 1972 New York City Subway Map and what we can all learn from the situation. Our story stars in New York City, the 1964 World’s Fair brought an unexpected wave of over 50 thousand visitors to the city all trying to navigate a foreign subway system with mixed results. This led the Transit Authority to redesign the map and it was released in 1967. This map was better than what they had and used color-coding for the first time. However, in the early 1970’s when the Metropolitan Transit Authority was formed the new head of the agency, William J. Ronan, wanted a new more modern map of the subway system. Having been working with the design agency Unimark on other signage projects, Ronan asked them to also redesign their subway map to be more modern and solve the issues that had arisen from the 1967 version of the map. I see these types of committees and presidents a lot as a graphic designer. Whenever someone takes over an established company and especially in the case of a merger. The new head, wants to make a statement. Often times, this statement is a total re-brand. The new map was Ronan’s big brand statement as the newly appointed head of the M.T.A. The map redesign project was overseen by art director and designer; Massimo Vignelli. At this point in time, Vignelli was already an award-winning designer. He had come to the United States from his native Italy in the late 1960s to set up the New York branch of the Chicago based, Unimark International. The map created by Vignelli and his team was released in August of 1972. Eager to get the map out there, the M.T.A. skipped their usual field-testing with the general public and pushed the release of the map. This gamble did not pay off. The look of the map was very clean and modernist. It wasn’t really a map in the true sense of the word, but more of a diagram. It was based on the diagrams used in parts of Europe to explain the subway or underground trains systems there. Without market research companies can’t address the issues that can sometimes arise for their customers. This is exactly what happened with the 1972 release of Vignelli’s modernist map/diagram. “The Vignelli Map” as it started being called shook the general public and was highly criticized. A majority of the criticism had to do with the fact that it wasn’t a true map and the topographical details typically found on maps wasn’t there or was distorted in some way. The general public didn’t like the water around the station stops was depicted in browns versus blues. They didn’t like that landmarks and open spaces were incorrectly sized. The public also didn’t like the inaccurate placement of stations and rail stops in an effort to streamline stations. This map, wasn’t a little hand-held pamphlet either, it was wall signage and large posters that went up at different points in the subway system. In this case, the design team was up against a challenge. On one hand, they needed to simplify the confusing maze-like subway system into something legible. This is especially true since the New York subway system, at the time, was very confusing as it was the product of a merger of three different companies’ stations and rail lines. On the other hand, they need something the general public and the out of town travellers that the map was meant for want to use it and feel they can understand. 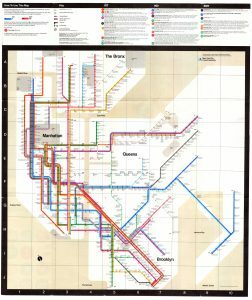 Two additional factors that I feel led to the eventual discontinuation of the Vignelli map were that it was part of a series of four maps, with only one being released and the other is that is was called a map versus a diagram and the public was expecting something different than what was released. 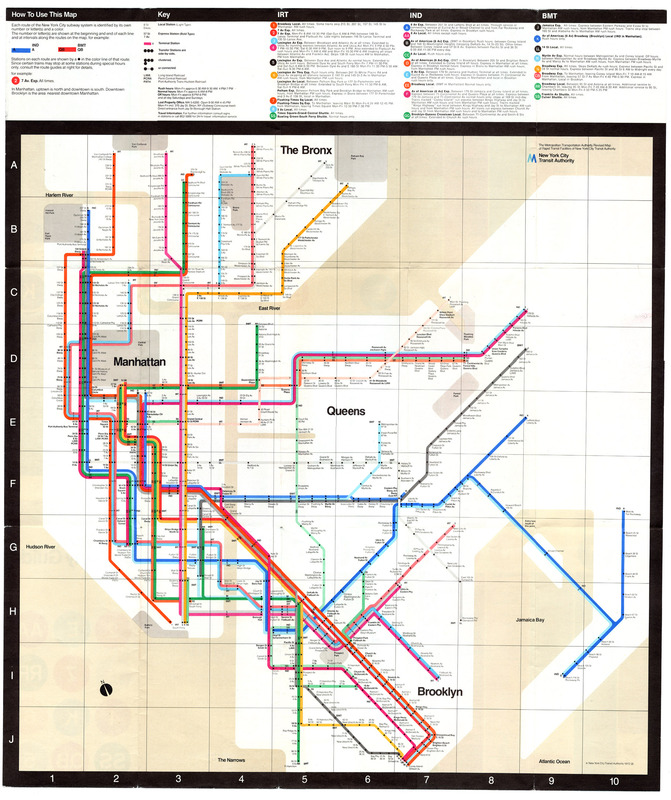 The Original Vignelli Map was used from 1972 until 1979. In 1979, a new map redesigned by a different designer was released. After a series of redesigns, Vignelli and his team were invited back to design a newer updated version of their iconic map in 2008. A few years later to create an interactive version of their map called the Weekender. Vignelli agreed to creating the Weekender on the condition that all of the parks and topography were removed and that it was called a diagram versus a map. M.T.A. agreed on these conditions and it was released in 2011 and as of 2015 was still in use. This situation illustrates how design can make or break something. The design of the diagram was good and easy to read as long as the user was expecting a diagram. However, the riders were expecting a map and were trying to orient themselves with topography, which a diagram isn’t going to help them do. This led to the project being considered ‘flawed’ and was replaced. It also shows how important it is to follow the design and marketing process and to not skip steps. Skipping steps and rushing to release a project can lead to total crash of the project because there isn’t time to smooth out the major flaws or bugs in the project. Hopefully, you learned a little something interesting and if you need help using visuals to communicate to your audience, contact me! As a graphic designer, I’ve created logos, but I also work with logos on a regular basis. Logos have stories, there is a reason why a businesses logo speaks to them and why it reflects their brand. I’ve collected few stories of how and why real business owners chose their logo. I’ve also included my professional takeaways to give you some insight into good points of each logo and points that may cause issues in future. Let’s meet some of my business owner friends and their logos! This logo is very personal to me. I designed it myself, and if you look really closely you can see pen marks where it’s colored in – it’s actually a photo of the original drawing. Our little mini-business is breeding and showing POAs (Pony of the Americas), which are Appaloosa colored ponies. Since we started about 25 years ago, we’ve had several World and International champions, Regional and State champions that we’ve either shown or bred or both. Our ranch is called Skyrock POAs. I’m part Cherokee, and you can see that the logo is drawn in a Native Southwestern style. 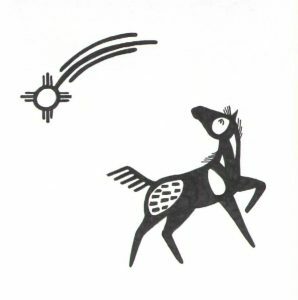 It has a spotted pony, and a shooting star, or a ‘sky rock’. A shooting star has meaning in many cultures, but I like the ‘wish upon a star’ element, meaning to fulfill your dream. We are small and on a shoe string, but the name has become well known across the country. So it combines 3 or 4 elements into one design and I feel it really represents us and what we do. Designers Takeaways: “it combines 3 or 4 elements into one design and I feel it really represents us and what we do.” To me as a designer, that sentence is the one I want you to notice. This is what a logo should do at the end. It should combine multiple elements to create something that reflects you and your business. Reflecting you is important especially when you’re a small business like Skyrock POA or an individual agent /solo entrepreneuer. My parents had a liquor store. The logo ended up being a world, Cappy’s World of Spirits, it started to be just Cappy’s, but when we were all working trying to set up the store my sister, Kathy, drew a world on a fabric sheet trying to have the feeling of all the different areas of the world where the liquor and wine came from. [I don’t know] if my parents were just humoring Kathy and using it at the time – it seemed to stick. We had world globes of all sizes in the store and people seemed to bring globes in and leave them. 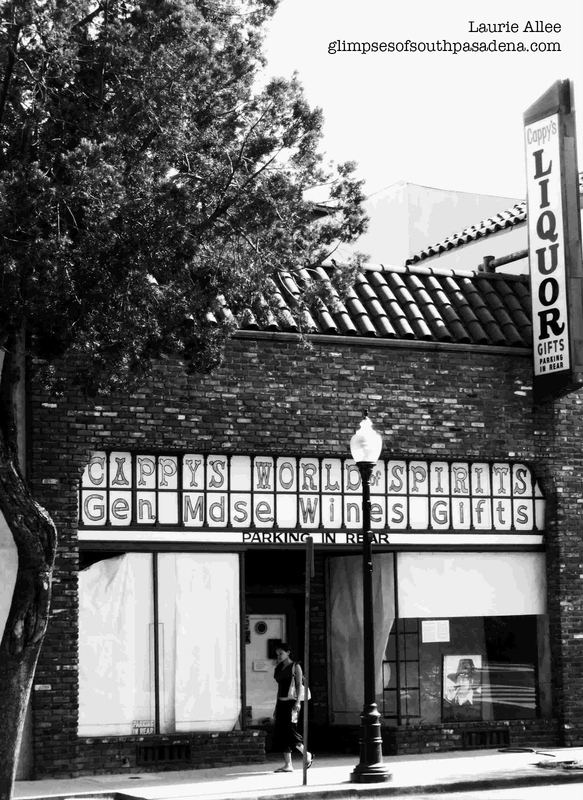 Cappy’s World of Spirits now just a ghostly store…. Designers Takeaways: Similar to SkyrockPOA, Cappy’s World of Spirits is also a family run business with a hand drawn logo. While I personally don’t have an issue with using a hand drawn logo created by the owners or their family, other designers might not be so accepting. Logos generally have a lot of research behind them. This research helps the logo do many things to help the business including positioning a brand in the marketplace, standing out from their competitors, and avoiding plagiarism among other things. One of the things that can happen if a logo is drawn with out this research behind it is a risk of accidental plagiarism, similar to what happened with the Rio Olympics and the Tokyo Olympics. Lastly, Businesses that choose to hand draw their own logo may need their logo created in a scalable digital format that works in many sizes for other items such as signage, websites, and promotional products. On the positive side, I love that their logo, a globe or world, which is also part of the name of the business, reflects the décor of their shop. A brand is a lot more than a logo. Branding is about the décor of the business, the mission of the business and the service experience of the business’ customers. The logo is the visual representation of all of these traits. I started by writing down words I liked, words that felt connected to my purpose and the energy I wanted behind my brand. Then I asked people to tell me what makes me stand out, why they’d want to work with me over someone else. This generated a lot of descriptive words about me that I may not have thought of myself. Between those two activities, I had a long list of words and concepts to play with. Process of elimination and combining different words resulted in Manifesting Wellness because whether it’s teaching people about the benefits of essential oils or chemical-free living or empowering them with personal growth coaching, this is my desire for everyone…to manifest wellness in their lives. The colors are my two favorites; purple being my absolute favorite. My graphic artist came up with the design, with the idea of me spreading light to everyone as the image. Designers Takeaways: I think this method is a great way to get started on not just a logo, but also naming a business. In Kathleen’s case, she’s an independent agent and her business name needed to reflect her as a person. For a business that starts off with more than one employee or is definitely something that might be scaled to include employees in the future, think about the purpose of the business and who its customers are or will be. Write down words based on the qualities of the business and what would attract their perfect customer. I chose my logo when I was in Esthetician school. As part of the licensing requirement students were allowed to see clients through the school. Toward the end of the term, the instructors told us to create business cards and practice handing them out to clients. I had the image of a tree in my mind and Thrive. When I went on Vistaprint, I looked through images of trees and colors…nothing popped. Then I saw this image- BAM!!! The face was bold- only 2 strong colors- and a butterfly. In that moment I changed the name of business to Swallowtail Skin Therapies. Recently, Swallowtail butterflies appeared as answers to my prayers. It is a striking image and it owned by Vistaprint. For now it works, it gets my business noticed and I am remembered. In time, I may change it. And I am patient. Designer’s Takeaway: It is pretty common for new businesses especially independent agents, “solopreneurs”, and the like to use template sites for their initial marketing materials from template sites. As a graphic designer in Orange County, I’ve seen countless business cards and logos from large template sites over the years. If you’re fresh out of school or want to test out your business concept and just get your feet under you, then sites like these are fine. Unfortunately, when a business uses logos and marketing materials from a template site they don’t own the designs, which means a rebrand and an investment in custom branding is in their future. Also, their chances for being confused with a competitor are higher than businesses that have made the investment in custom branding. The name of our yoga studio came to me in a dream 15 years before its inception. Full Circle Yoga comes from the heart of the phrase “come full circle,”whose many meanings transcend culture, and provide an expectation of what a healing center should be. Healing centers should be a place of education and experience to help you to move along your path with guidance and care. But the transformation takes place when there is a point at which you feel differently about yourself and the connections you hadn’t made before. Some meanings and images of this phrase “Full Circle” that we associate with our healing center are embracement, inclusion, connection, perseverance, realization, and insight. Designer Takeaway: This is a great story. It speaks to their brand, which again is a buisness’ décor, mission, and the feeling their customers have about them among other things. I think it was also a smart choice for them, marketing wise, to have what they do, yoga, larger than their name (despite that some people confuse the name). By doing this, it allows potential customers to know what they do in 10 seconds or less. I feel like their name inspired their mission rather than the other way around, but the best part is, that’s okay. I love suns, I’ve just always been attracted them! I didn’t think to tell you that. I just gave you the word shiny and waited to see what you would come up with. I loved [my logo] then (when it was first finished) and I put it away for a while, but now, I took it out and looked at it and I still love it. It’s perfect. Designers Takeaway: A past client told me the above logo story. I’m hoping I transcribed it correctly. What I think this story shows is the power of a designer. When a business owner uses a designer to create their logo, it’s the designer’s job to create something that reflects the business or the agent/coach even if they just provide a few words such as Shiny or Modern. A good logo also has staying power, it’s something that is liked and useable by the business when it’s first created, but also years down the road. I wanted a logo that represented class and fine dining. I wanted a white glove because that is the service I give to my clients. The tray is because we offer service at every level. Gold of the tray to reflect prestige. 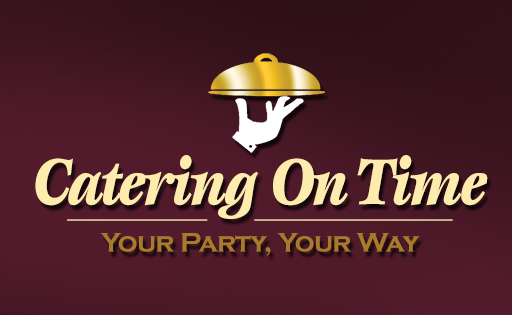 The line underneath Catering On Time, is to emphasize the company name. Your Party, Your Way, is to make sure people know we would like their experience is truly for them and their ideas for their party. Designers Takeaway: I love how much thought went into each part of their logo. If someone has clear intent of what each portion of their logo should mean and how it will tie in with their business they need to clearly indicate that to their designer. A designer client relationship is built on trust and good two-way communication. When those things happen, a business gets a logo that fits their vision just as Catering on Time’s logo fits their vision and reflects their brand. These are just a few stories of how and why real business owners chose their logo. I hope they’ve inspired you a little to choose a logo that reflects your company’s brand and all that a brand entails. There is no right way to create a logo, but it is in a business owner’s best interest to hire a professional graphic designer to help you. If you do need help with a logo find a graphic designer that you trust and feel you’ll share good communication with each other. Obviously, I hope you’ll consider Purple Rose Graphics and look forward to the honor of helping you grow your dream. This is a time of year where as much as things speed up they also slow down. They let us take a pause and reflect on the past year. It’s a time where we can express our gratitude for all that we have. This is a great time of year to show your gratitude to your clients, your employees and your loved ones. Without their support all year we wouldn’t be able to continue to run our businesses. There are so many ways to show your gratitude, I’ve compiled a short list of things you can do! My favorite way has always been with a card. I think the tangible aspect of having something to hold is great. It’s a physical reminder that you are thinking about the other person. My dad’s late boss used to this. Every holiday, he’d get a lovely card in the mail with a personal note from the boss. Even after he retired, the cards kept coming. I fell in love with the idea of sending a card because I could see how much those cards meant to my dad. That’s why I, personally, like to write my own message on the inside, but if that’s not you, that’s okay. There are plenty of cards out there with messages already to go on the inside. If you’re worried about what to say, write from the heart and tell the person a few (nice, clean) reasons you’re thankful for their support or write a favorite quote on the inside. I’m a graphic designer so I love to make my own cards and I love to make cards for my fellow business professionals. This is great for sales professionals and those in management. This is another great one for those in sales or management. Choose a fun item that has a purpose such as a mug or photo frame. You can contact a promotional items company to get them for you with your company name, logo and message on the item. It’s a sweet gift that will show the recipient that you are thankful for their support, plus it’s a great marketing tool as these items usually sit on a person’s desk all year long. This is the easiest and least costly item on the list. It still has impact because you are reaching out with a personal phone call or email. There are so many apps now that let you write on your photographs and you can easily use that as quick e-card. Personally, I’d opt for the phone call because it harkens back to an era when the pace of life was slower and a lot less digital. Nowadays, we’re overwhelmed with e-mails so the phone call feels more personal to me. However, if e-mail is the recipients favored mode of communication, use it! This is the second easiest one and perfect if you have a lot of clients to thank. Provide a discount code on a pre-determined product or service. You see this a lot with very large companies, but small companies can do it too. This method thanks current customers for their support and can also be used to attract new customers. Here are just 5 ways to show your gratitude for your clients and/or employees. I hope they have inspired you to be show your thankfulness this time of year. Lastly, thank you all so much for your support of Purple Rose Graphics! None of this would be possible with out you. So, thank you for everything! As a graphic designer in Orange County, I get asked a lot about fonts & how to choose them. There is some technique to choosing fonts or type, but I’ve assembled a few tips to make the process a little easier. 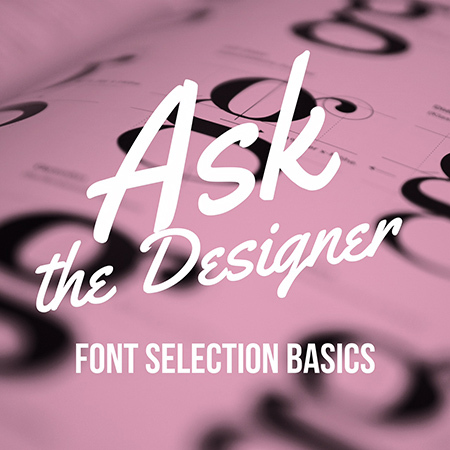 Here are some basics to get you started in being a font selection pro! You must know who your customers are! Know the look they expect to see! Use fonts that appeal to the age & demographics of your customers. For example a bank’s customers expect to see something more formal & professional looking than customers of a daycare center would be looking to see. You can also choose type based on era. For example if you’re having a 1950s themed event, you can choose fonts that have a 1950s feel to them! When first starting out don’t clutter it up by choosing 6 different fonts! It looks disjointed & can be confusing!! Stick to 2-3 max! There are so many different font classes that I could (and will) devote a whole article to them! These include Serifs (like Times New Roman), Sans-Serifs (like Arial), Scripts (Edwardian Script) to name a few! It helps to know the classes of fonts because it keeps you focused when choosing a specific font! A chunky font with a skinny font look great together because they have different weights. The same goes for a script with a serif! Any time you have contrast you’ll have interest! So think about how you can create contrast by selecting different weights, heights, or styles. I hope this helps make choosing fonts for your next project a little easier. If you still feel like it needs the touch of a pro, please feel free to contact me! Let’s Connect on Facebook! View Me on Instagram! Follow me on Twitter! We live in a very social world where Facebook and its Social Media peers have taken over as main way for customers to connect with their favorite brands. Due to this shift, social media has become a place where graphic design is starting to (if it hasn’t already) become very important. This means your brand’s look needs to extend to your social media accounts. It’s a place to have a little fun with your design’s look, while keeping your brand’s message consistent. The most social media savvy folks are posting multiple times a day. I interviewed Eric Padilla, the owner of Palatable Promotions in Brea and got the scoop for everyone on how to get your social media accounts on point. Here’s his tips and a few of my own! Don’t ignore your banner/profile/timeline photo. Keep your photos and pictures to the point. One of the things Eric and I agree on is using custom graphics. We both feel that using custom graphics is the way to go because it keeps your branding consistent and looks professional. It all goes back to your first impression. You want to consistently use your graphics to create a good first impression and enhance your image with your customers. Eric adds that “With proper usage of branded graphics, photography and engaging content, a social media page can not only capture an audience but retain it. 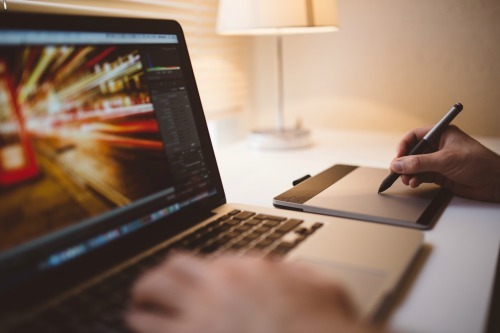 Using outdated graphics can hurt engagement and ultimately reach.” Having custom graphics helps with brand recognition, which should be your first priority when marketing. Companies that are remembered and trusted are companies that are hired. There are many factors he says that will boost a company’s bottom line on social media including consistency, ad budget and type of page to name a few, but custom graphics are a big help in getting and keeping customers coming back to your social media pages for more! Don’t use too much text on social media. Now you have a few tips that can inspire you to set up or polish up your social media accounts. So, if you’re ready to get your social media graphics on point then give me a call. Let’s create something amazing together. The weather is warm ing up and the days are getting longer, which means it is definitely spring time and also graduation season. Many students are graduating in May and others in June. These are also times for celebratory parties and often times proud parents create banners for such occasions. Here are few things to remember when creating a banner! Don’t crowd the banner. It’s a large space in the sense that it is measured in feet with the average banner running around 5ft x 8ft. However, a banner crowded with text and pictures is going to be harder to see all of the elements at a distance. Keep it to a few major pieces of text and one or two images. For example you can say “Congratulations [Name]! Class of 2017!” as text and use a photo of your graduate or the school’s logo as images. Remember the photo or the logo that looks so crisp and nice at 5 inches may look fuzzy or blurry at 5 feet. That’s because small photos, especially digital photos, lose resolution quality (aka they get blurry looking) as they get larger. If it’s a photo you don’t have in any other size but a small size, for example a scanned childhood photo, that you simply must use, be okay with it looking less than perfect. As a graphic designer in Orange County, I do everything I can to give my clients crisp looking photos, but no system is perfect and sometimes the photos simply can’t be that big. To get best quality photos on your banner, provide the largest photo file you can to your designer or local sign shop. A large item like a banner needs to readable from a distance. It is best to use text that contrasts with the background. A light background color such as white or yellow with a dark text color works best. A favorite option for many creating a banner for a graduation are to use the school’s fight colors. For example, Cal State Fullerton’s would be orange and blue and UCI’s are blue and gold. A thicker darker heavier font such as Impact, Rockwell or even Helvetica Bold will be easier to read. -Use large photos with a high resolution or be okay with the photo be slightly blurry or fuzzy looking. 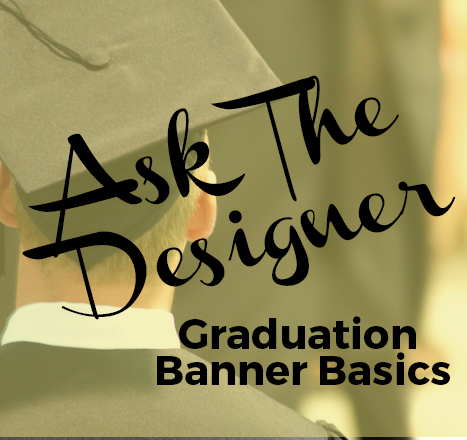 Whether it’s being held at the graduation ceremony or it’s adorning a wall during a celebration I hope these tips give you a little insight to creating a great banner that your graduate will keep for years to come! If you need help designing the perfect banner contact me today! I fell in love with design as a child during numerous family trips to the local bookstores. It was through book covers & later magazine spreads that lead me to want to be a graphic designer. Since April 4th is National Librarian Day it seems fitting that I write about a famous book cover & the designer who created it. 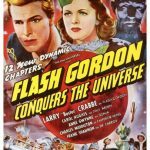 Why are Book Covers important? Book covers are the finishing touch on an Authors journey to publication. Occasionally, they are the sole reason a reader buys a book. Ultimately book covers are a marketing tool. They are the attention grabber that gets the audience to stop & read the back of the book and are used in other promotional material for the sale of the book. Yes, and no. Most designers are happy to design a book cover for an author. However, designing book covers is a specialized niche industry. There are entire design agencies that do nothing but churn out amazing book cover designs. Do any of these book covers become iconic? Sure, actually a lot of book covers become iconic. They end up influencing design as an industry. Often these cover designs create trends that permeate down into general design. My favorite example is that book covers and general design a few years back favored a minimalist look, solid colors & thick geometric type. Often, book covers can spark trends in the general public, especially when they become movies! This is exactly what happened in the 1990’s with Jurassic Park. What h appened with Jurassic Park? In 1990, author Michael Crichton released his novel Jurassic Park. His publishing house, Alfred A Knopf, had one of their designers create the book cover for him. The designer, Chip Kidd, created a book cover featuring a skeletal silhouette of a T-Rex. 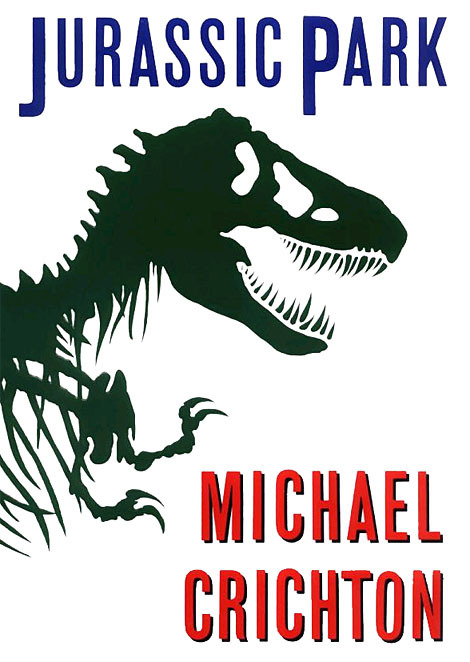 As anyone who is familiar with Jurassic Park knows the T-Rex is one of the main dinosaurs featured, so it makes sense that it would end up being the book cover. Jurassic Park got chosen to be turned into a movie in 1990 when Steven Spielberg was working with Crichton on a pilot for a TV show. Often when a book gets turned into a movie a new look is created for the movie posters & marketing materials. Steven Spielberg who directed Jurassic Park liked the dinosaur skeleton on Kidd’s book cover, so he kept it. 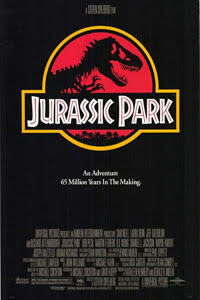 It became part of logo for the movie & for Jurassic Park itself in the film. After the movie was released in 1993, everyone went dinosaur crazy. The poster, dinosaur skeleton image & Chip Kidd became iconic. Kidd is a graphic designer who focuses on creating book covers. He is credited with creating a paradigm shift in the book cover design industry with his striking, artistic and impactful cover designs. Kidd still works in the industry & has been with the publishing house Alfred A Knopf since the mid -1980s. He’s rumored to create around 75 book covers a year, which is pretty prolific especially since a cover can take months to create. His long list of clientele includes Michael Crichton, John Updike, and Dean Koontz among other famous authors. While I’m not as famous as Chip Kidd, I’d still like to help you create a great design for your business or event. So if you’re looking for custom logo design, business cards, or branding products, give me a call or use my handy estimate request form! 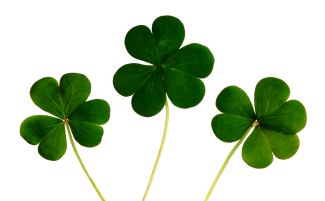 When most people in the United States think of the month of March they think about Saint Patrick’s Day, with it’s green color scheme, and love of all things Irish. However Saint Patrick’s Day flattens out a robust culture to a few tired stereotypes. Archeologists believe that humans first stepped foot on the island around 10,500 BC/ BCE. Since that time it has been home to many groups including the Celts, the Normans, the Romans and the British. 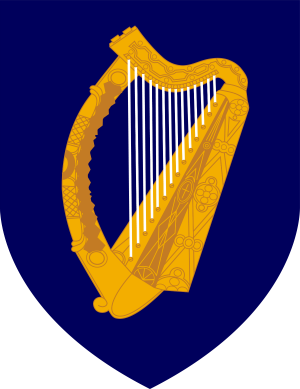 Due to so many groups living there over the centuries, Ireland is full of history and symbolism. Ancient Irish culture, specifically the Celts, have inspired many designers. Before I talk about the hallmarks of Celtic Design as we know it now, I want to delve into history a little bit. Although they first appeared in ancient Greek and Roman texts around 2500 years ago, the Celtic peoples lived across Western Europe during the Iron Age. They were referenced in these texts as a single group, but that wasn’t true. The Celts were tribal and nomadic people with not one tribe or region, but around eight of them. Each region had a separate language. Today only Irish Gaelic, Scottish Gaelic, Cornish, Breton, Manx and Welsh are still spoken. The Irish Celts had a vibrant culture that centered around the clan system. They created art for all types of purposes, some we know about and some are still a mystery. A lot of the art left behind is stone and metal work, which doesn’t give a clear picture of all of the art that was created by these groups. Much of the art we do know about was created but monks but not all of it. It was very ornamental, featuring very little symmetry and preferred curved lines to straight lines. 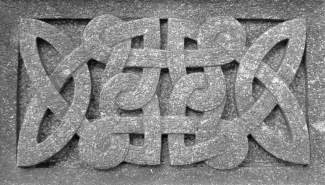 Celtic artwork shows influences from other cultures and features a variety of spirals, knot work and figures and more. motifs of interlocking knots, images of nature, and spirals. colors are highly saturated and bright. type that imitates the hand drawn letters originally created by monks for illuminated manuscripts (books with pictures and text). It’s still a very popular style of design. It calls to us through the ages because it gives a chance to embrace our roots and explore a time and a people that we don’t really understand. It’s November already and that means holiday and holiday travels are around the corner. Air travel has made it possible for the average American citizen to be “home for the holidays.” Air Travel in America became popular in the 1950s with the rise of jet planes over air piston planes. The 1950’s also happened to be part of the golden age of advertising when the real “Mad Men” were busy creating now iconic posters for travel companies. One of the most popular styles of poster was created during this time. That popular style was known as the “International Typographic Style”, also known as the “Swiss Style”. 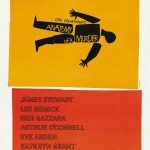 Hallmarks of the Swiss Style are a clean structured layout with bright colors. They usually featured just a few design elements with simple easy to read text and sometimes a slogan or tagline. Another popular style was a version of pop art. Today it could be called “retro style” as this particular type of pop art is a classic style of advertising design from this era. Much like Swiss Style, “Retro Style” also features bold graphic images and very little text. Although it does have more text in some instances than Swiss style. No matter the style, these posters feature air travel as exotic, exciting, affordable and safe. Air travel used to be a luxury reserved for the wealthy and many people still didn’t believe that it was safe. 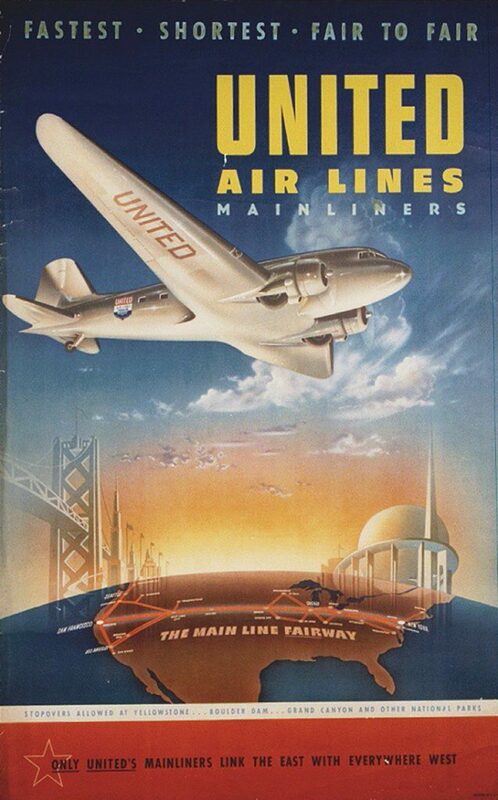 The posters had a double use, they had to convince people to invest in air travel, but they also had to convince people to use a specific airline when they did travel. As a graphic designer in Orange County, I design a lot of flyers and posters. So I can tell you that the main job of a poster (even now in the age of social media and smart phones) is to reach out to a business’ target market and convince them that they need a specific brand’s products. Overall, that’s an easier poster to make because you only have one objective. In ve ry simple terms, the marketer and designer isolate the target market and choose the best way to convince this market that they need a specific company’s product over the competition. What the airlines at this time were facing wasn’t just how to fill their flights over their competition, but how to fill flights overall. It’s a two-pronged objective and makes the creation of their marketing and poster advertising that much harder. 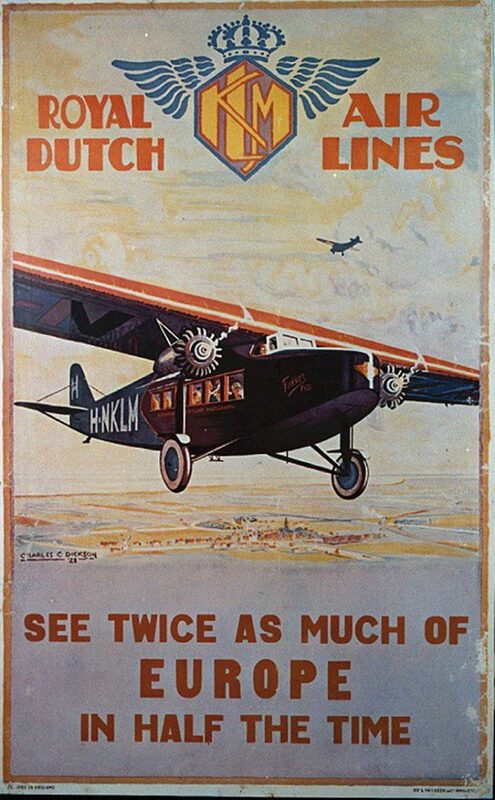 That’s why a lot of the posters emphasize a certain city or region with the name of the airline in much smaller type. 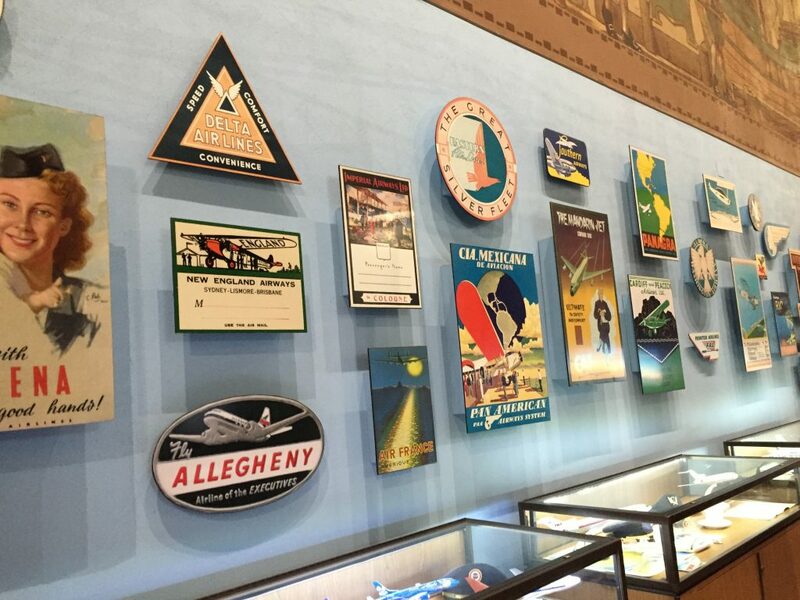 Even after all the twists and turns travel posters and airline marketing have made over the years, those early days are still looked back on with nostalgia. 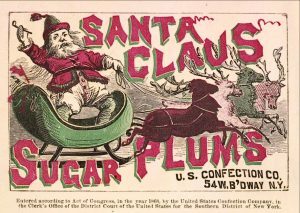 What made those posters incredible (and something we still want to emulate) is that they achieved a two-pronged objective of creating an industry, and notable brand within that industry, all with just a few hand-drawn graphic elements and very little text. Today they still evoke an emotional response in us, and that is why we keep going back to 1950’s design and the era’s iconic travel posters. If you’re looking for a graphic designer in Orange County to help you come up with a poster for your business, contact me today for a quote.